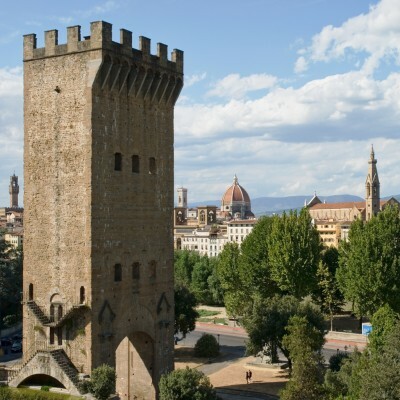 One of the most impressive monuments in Florence and on of the closer to Hotel Bologna is certainly Porta San Niccolò, also known as Tower of San Niccolò, which was built in 1324 to defend the Oltrarno district. In recent years the Tower has been opened to the public only in Summer days, starting from June 24, the day of St. John the patron saint of Florence and usually until the end of September: visits take place every day from 4 pm to 8 pm with guided tours in Italian and English (max 15 people) every 30 minutes. The Tower of San Niccolò, was separated from the rest of the Florentine walls, and remained the only tower in Florence that has not been "cut down", i.e. lowered from its original height. Needless to say, arrived at its top after about 160 steps, everyone can enjoy a wonderful 360 view of Florence and take pictures of unusual and unseen views to most tourists! The visits do not take place in case of rain. Hotel Bologna we will be happy to provide you with all information on how to reach Porta San Niccolò, as well as to assist you in booking your visit.